Phase 1 – Pre Arrival Direct mailings were sent to 200,000 new students. We also placed web banners on 20 priority Students’ Union official website to coincide with A-Level results day to drive traffic and sign ups. 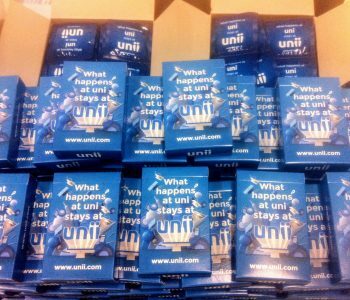 Phase 2 – Arrival Information, branded playing cards and condoms were placed into 100,000 student halls of residence across the UK, targeting students as soon as they arrived on campus. 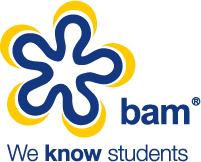 Phase 3 – Face to Face We then secured headline sponsorship of the UK’s biggest student shopping events, providing brand awareness and direct access to over 150,000 students. In total we attended 23 events across the UK. In addition to the branding and on-site presence, we also negotiated a bespoke data agreement which provided a host of direct sign ups. We also targeted students face-to-face through a selection of targeted university Freshers’ Fairs. Phase 4 – Follow up E-mails To follow up this face-to-face presence, we sent targeted emails to over 500,000 students at selected UK institutions. We have also continued to support Unii throughout the year, following up the initial campaign with over 1,000,000 student email sends.